Verdura Resort is located on the southern coast of Sicily in a small village called Verdura, near Agrigento with Sciacca. The Valley of the Temples in Agrigento and the Temple of Selinunte are both just a 40-minute drive away. It is a one-hour drive from Palermo's international airport. From delicious cuisine to ancient architecture, the island of Sicily has been delighting visitors for centuries. 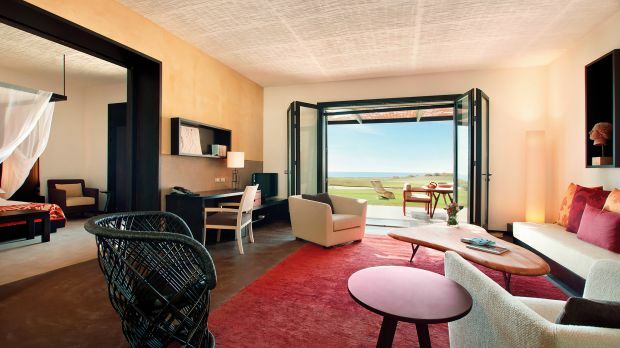 Verdura Resort places guests amidst one of the most beautiful and culturally rich areas of this Mediterranean island. Above all, it's a place where you'll discover an outstanding level of service. Wake up to uninterrupted views of the sparkling Mediterranean Sea in one of the 203 rooms, suites, and villas. All are decorated in a warm contemporary style, with rich earthy colors and natural materials. Golfers will feel right at home on the two championship 18-hole golf courses at Verdura Resort. Designed by renowned golf architect Kyle Phillips, the courses are laid out across a pristine section of coastline. With four restaurants and five bars, Verdura Resort offers a choice of gourmet restaurants. From delicious regional specialties to expertly crafted Sicilian-style cocktails, guests will be treated to the inspiring flavors of the Mediterranean. Send an availability request with your requested dates to the Verdura Resort. Features 1 King bed or 2 Twin beds, a view of the Mediterranean Sea, spacious bathroom and balcony. Features 1 King bed or 2 Twin beds, terrace with sun loungers, panoramic sea view, large stone bathroom, spacious seating area and separate walk-in rain shower and bathtub. Features 1 King bed or 2 Twin beds, terrace with sun loungers, panoramic sea view, large stone bathroom, spacious seating area and separate walk-in rainshower and bathtub. Features 1 King bed or 2 Twin beds, balcony with seating area, sea view, large stone bathroom, spacious seating area and separate walk-in rainshower and bathtub. Features 1 King bed or 2 Twin beds, private terrace with sun lounger, sea view, complimentary breakfast buffet, large stone bathroom, spacious seating area and separate walk-in rainshower and bathtub. Features 1 King-size bed, a view of the Mediterranean Sea and the Verdura golf courses, spacious bathroom, separate walk-in shower and full–length seating area and Ortigia bathroom amenities. Features three bedrooms, three terraces and a private pool. Features three bedrooms, terrace and a private pool. Features three bedrooms, three terraces, a private pool and Jacuzzi.